It’s a pain that never went away. And for months, the doctors didn’t take me seriously. They gave me prescription-strength Advil, Lidoderm patches, and told me to wear looser bras. So, for weeks on end, the pain got worse and worse, while I tried multiple doctors, trying to find someone who could help. I was in so much pain that I would often lay down on the ground mid-sentence because I didn’t have it in me to keep standing. The pain was just that overwhelming. And at night, after trying to survive the day, I would lay in bed and plan ways to commit suicide. I wish I was exaggerating. Finally, I found a pain specialist who put me on hydrocodone. At the time I had no idea that opioids were controversial. I was just happy to finally have found something that gave me relief. The problem with hydrocodone though is that it comes with these crazy spikes. So you take a pill, it relieves the pain and then it completely wears off within a couple hours — and you to wait six hours for your next dose. It’s a horrible way to live. I’m also on a time-released morphine that lasts about 8 hours. I take it three times a day — so I am always on an opioid, 24 hours a day. And then, on top of that, I also take hydrocodone as needed. I pretty much always need it. The pain still gets bad. But now, because of the pain pills, I have times when I am nearly pain free. Times when I can catch my breath and remember that life is worth living. Opioids have literally saved my life. I realized when I read the article that I am spoiled by my Facebook news feed. I tend to follow chronic pain groups, so most of the information I see is about how chronic pain patients need access to these drugs. As a result, I’ve been lulled into thinking that the chronic pain community is actually making progress on this issue. And it is articles like this that make it that much harder for pain patients like me to get the relief they need. Let’s break down what it gets so wrong, with some quotes from the report. 1. It implies time-released morphine is basically heroin. Aside from the excessive number of commas, there are so many infuriating things about this sentence. While the drugs can give you a “high” feeling when you first start taking them, I can promise you — after being on morphine all day, every day for over a year — that the “high” is only a short-term side effect. Also, comparing the drugs I take to heroin is like saying that both TIME and US Weekly are similar because they both require reading. Yes, that’s true. But that’s about all they have in common. 2. The article focuses on how much the drug companies are supposedly making on these meds. While there have been some new meds on the market, like Zohydro, the pills that I take and the pills most of the people I know take, are generic. Morphine isn’t exactly a brand name. Giving people relief from horrific, daily pain is not part of some drug company conspiracy. It’s called compassion. 3. It devalues how horrible pain can be. The author writes that like it’s a bad thing. I’m here to tell you, it’s not. Pain is such a huge part of your health. And managing it is just as important as managing your blood pressure or your insulin level. Having too much pain will ruin your life and your body just like any other health issue. Living with chronic pain is like living every day of your life with the same amount of pain you would wake up with after an extensive surgery, or a horrific car accident, or a stabbing. Anyone in those situations would be given adequate pain relief. And, just because people with chronic pain have that same pain every day, all day, doesn’t mean they don’t deserve the same relief. I don’t need to “get clean.” I need a cure, but there isn’t one for what I have. The next best thing is daily pain relief. Going off all my meds would be catastrophic for me, not because I’m addicted, but because I would end up stuck on the couch for the rest of my life in too much pain to shower. Addiction is when you start to crave that high feeling you get the first few times you take the drug, so you start taking higher and higher doses seeking it out. Sort of like how all of us are dependent on food, while a select few are addicted. 5. The authors don’t mention any alternatives. For those enduring chronic pain, the real-life alternative to not having adequate pain pills is suicide. Articles like this just make it that much harder for people with chronic pain to get the medications they need. If you want to see the suicide rate jump, just take away the medications that so many people rely on to do even simple things, like make dinner or do a load of laundry. Look, I’m not saying everyone with a cold should get a prescription for morphine. I’m just saying that there are millions of people out there who need these drugs. And more regulation just gets in the way of decisions that doctors and patients should make together to help those who are suffering cope with their pain. The government should never be in anyone’s doctor’s appointment. At the end of the day, I guess I just wish that TIME had talked to even one chronic pain patient for the article. 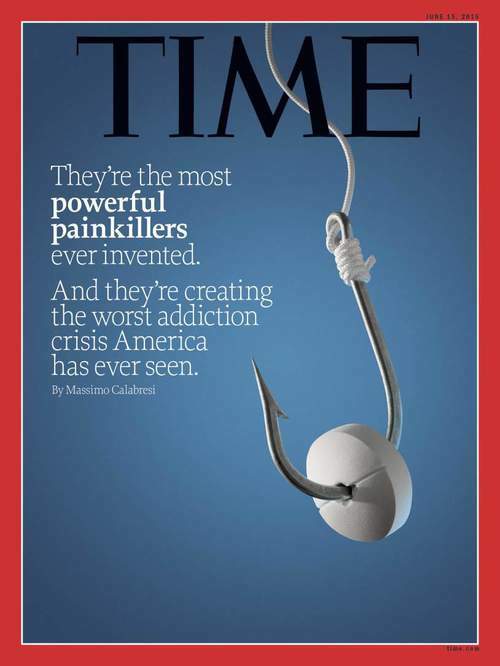 There are millions of us out here, responsibly using opioids long-term, and we would have loved to chat with TIME. why does it have to be so us-versus-them? The reality is that problems of opiate addiction and chronic pain both exist. Choosing to discuss one problem does not devalue the other problem. Their facts are not that off. If you haven’t already, I’d encourage you to do some research on how opiates work on the brain on a chemical and neurotransmitter levels, especially related to dopamine. If for no other reason, do the research to better understand why these medications do help you. The pathophysiology of how these drugs work helps explain why these drugs have a higher POTENTIAL for addiction (and thus why increased prescriptions does result in an increased percentage of addictions- they are related). This absolutely does not mean all people who need pain pills are addicts. Addiction can happen due to a combination of genetic risk factors and environmental stress and psychosocial support system- so some people are already predisposed or at higher risk of addiction before they take the drugs- and doctors are only just starting to assess for that risk. There are companies that profit off of generic drugs too. There have been falsified studies distributed by drug companies that have now been redacted (think Andrew Wakefield w/ vaccines) deceiving doctors into thinking the drugs were safer and had lower addiction risk than was actually the case. None of these facts and events are attacks on the legitimate need for pain meds. The crux is that acknowledging and having a healthy level of respect for the risk of these meds does not deny the legitimate need for them. The push now is to find ways to mitigate the risks without limiting access for those who need the meds. The best way to move forward is going to be finding solutions that address both the risk problems and the access problems together. And there is a lot of common ground to be found there. Crystal, once again, I agree with everything you said (and although I have a bad habbit of using too many commas myself! )I have also written on this topic. The media and government are too quick to put opioid pain MEDICATIONS in the same category of street drugs. They do it often, and it has created a climate of shame and stigma regarding pain medications (which in most articles, unlike insulin, blood pressure meds, etc., they are almost always referred to as “drugs”). I appreciate your comparisons of chronic pain to constant acute pain. People who don’t have it just can’t seem to grasp that we can’t just drink some kale smoothie and “pull ourselves up by our bootstraps!” I am even more sick of people’s opinions about MY medications than I am of being sick!